Phthalates are industrial chemicals added to many consumer products such as food packaging, plastics (e.g., plastic bags, garden hoses, recreational toys, medical tubing, plastic clothes), adhesives, detergents, and personal-care products (such as soap, shampoo, and nail polish). Exposure can occur through food that has been in contact with phthalate containing packaging, as well as direct contact with products that contain phthalates. Acute high-dose exposure to di-2-ethylhexyl phthalate, for example, may be associated with mild gastrointestinal disturbances, nausea, and vertigo (U.S. EPA, 2015). Chronic exposure to phthalate compounds has been associated with damage to the liver and testes, cancer, birth defects, male reproductive effects, and endocrine system effects in animal studies. The extent to which these effects occur in humans is the subject of ongoing research (CDC, 2009; Kavlock et al., 2002a-g; NRC, 2008). This indicator is based on data collected by the National Health and Nutrition Examination Survey (NHANES). NHANES is a series of surveys conducted by the Centers for Disease Control and Prevention’s (CDC’s) National Center for Health Statistics that is designed to collect data on the health and nutritional status of the civilian, non-institutionalized U.S. population using a complex, stratified, multistage, probability-cluster design. CDC’s National Center for Environmental Health conducted the laboratory analyses for the biomonitoring samples. Beginning in 1999, NHANES became a continuous and annual national survey; biomonitoring for certain environmental chemicals also was implemented. Metabolites of phthalates are measured in urine as a biomarker of phthalate exposure in the population. Data for 1999-2000, 2001-2002, 2003-2004, 2005-2006, 2007-2008, 2009-2010, and 2011-2012 survey periods are presented here. 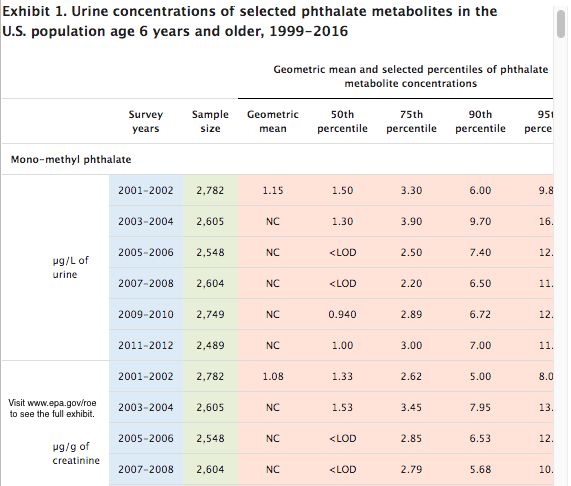 Exhibit 1 presents the geometric means and four percentiles for urinary concentrations and creatinine-adjusted urinary concentrations of 12 selected metabolites of phthalates among a subsample of participants age 6 years and older from NHANES (2001-2002, 2003-2004, 2005-2006, 2007-2008, 2009-2010, and 2011-2012). Seven of the 12 phthalate metabolites were measured in the 1999-2000 survey. Two of the phthalate metabolites (mono-cyclohexyl phthalate and mono-n-octyl phthalate) are not reported after the 2009-2010 survey because concentrations were largely undetectable in previous survey periods. Mono-ethyl phthalate (the metabolite for diethyl phthalate, an industrial solvent used in many products including those containing fragrances) was the phthalate detected in the highest concentration during the six survey periods, with creatinine-adjusted geometric mean concentrations ranging between 43.2 (2011-2012) and 120 (2003-2004) micrograms per gram (µg/g) of creatinine. In addition, other phthalate metabolites such as mono-n-butyl phthalate (a metabolite for dibutyl phthalate, which is an industrial solvent used in cosmetics, printing inks, and insecticides), mono-benzyl phthalate (a metabolite for benzylbutyl phthalate, which is an industrial solvent used in adhesives, vinyl flooring, and car care products), and mono-2-ethylhexyl phthalate (a metabolite for di-2-ethylhexyl phthalate, which is used to produce flexible plastics) were detected in urine samples. Phthalate metabolites that were not measured with sufficient frequency above the limit of detection to calculate a geometric mean included mono-cyclohexyl phthalate and mono-n-octyl phthalate for samples collected between 1999 and 2010, and mono-isononyl phthalate for samples collected between 1999 and 2012. Urine creatinine concentrations were used to adjust the urinary concentrations of phthalates and metabolites of phthalates in subsets of adults participating in NHANES. Traditionally, this approach has been used in population groups without much diversity. However, the inclusion of multiple demographic groups (e.g., children) in NHANES may increase the variability in the urinary creatinine levels when comparing across these different study populations (Barr et al., 2004). Differences in the excretion of various phthalates may be due to differences in either exposure or toxicokinetics. The low detection rates for some of the long alkyl chain phthalate metabolites may be due to significantly less metabolism to the monoester metabolite. It is unknown whether differences between ages, genders, or races/ethnicities represent differences in exposure, body-size relationships, or metabolism. Health-based benchmarks for phthalate metabolites in urine have not been established. The relatively small number of samples collected in a two-year cycle (e.g., 1999-2000 or 2001-2002) may, in some cases, result in measures of central tendency that are unstable from one survey period to the next. Data used for this indicator were obtained directly from CDC’s Fourth National Report on Human Exposure to Environmental Chemicals, Updated Tables, February 2015 (CDC, 2015), which presents results of the ongoing NHANES. The underlying laboratory data supporting CDC’s report are available online in SAS® transport file format at http://www.cdc.gov/nchs/nhanes/nhanes_questionnaires.htm. Barr, D.B., L.C. Wilder, S.P. Caudill, A.J. Gonzalez, L.L. Needham, and J.L. Pirkle. 2004. Urinary creatinine concentrations in the U.S. population: Implications for urinary biological monitoring measurements. Environ. Health Perspect. 113(2):192-200. CDC (Centers for Disease Control and Prevention). 2015. Fourth national report on human exposure to environmental chemicals, updated tables, February 2015. http://www.cdc.gov/biomonitoring/pdf/FourthReport_UpdatedTables_Feb2015.pdf (PDF) (1095 pp, 59.8MB). CDC. 2009. Fourth national report on human exposure to environmental chemicals. http://www.cdc.gov/exposurereport/pdf/FourthReport.pdf (PDF) (529 pp, 6.4MB). Kavlock, R., K. Boekelheide, R. Chapin, M. Cunningham, E. Faustman, P. Foster, et al. 2002a. NTP Center for the evaluation of risks to human reproduction: Phthalates expert panel report on the reproductive and developmental toxicity of di-n-octyl phthalate. Reprod. Toxicol. 16(5):721-734. Kavlock, R., K. Boekelheide, R. Chapin, M. Cunningham, E. Faustman, P. Foster, et al. 2002b. NTP Center for the evaluation of risks to human reproduction: Phthalates expert panel report on the reproductive and developmental toxicity of di-n-hexyl phthalate. Reprod. Toxicol. 16(5):709-719. Kavlock, R., K. Boekelheide, R. Chapin, M. Cunningham, E. Faustman, P. Foster, et al. 2002c. NTP Center for the evaluation of risks to human reproduction: Phthalates expert panel report on the reproductive and developmental toxicity of di-isononyl phthalate. Reprod. Toxicol. 16(5):679-708. Kavlock, R., K. Boekelheide, R. Chapin, M. Cunningham, E. Faustman, P. Foster, et al. 2002d. NTP Center for the evaluation of risks to human reproduction: Phthalates expert panel report on the reproductive and developmental toxicity of di-isodecyl phthalate. Reprod. Toxicol. 16(5):655-678. Kavlock, R., K. Boekelheide, R. Chapin, M. Cunningham, E. Faustman, P. Foster, et al. 2002e. NTP Center for the evaluation of risks to human reproduction: Phthalates expert panel report on the reproductive and developmental toxicity of di(2-ethylhexyl)phthalate. Reprod. Toxicol. 16(5):529-653. Kavlock, R., K. Boekelheide, R. Chapin, M. Cunningham, E. Faustman, P. Foster, et al. 2002f. NTP Center for the evaluation of risks to human reproduction: Phthalates expert panel report on the reproductive and developmental toxicity of di-n-butyl phthalate. Reprod. Toxicol. 16(5):489-527. Kavlock, R., K. Boekelheide, R. Chapin, M. Cunningham, E. Faustman, P. Foster, et al. 2002g. NTP Center for the evaluation of risks to human reproduction: Phthalates expert panel report on the reproductive and developmental toxicity of butyl benzyl phthalate. Reprod. Toxicol. 16(5):453-487. NRC (National Research Council). 2008. Phthalates and cumulative risk assessment: The tasks ahead. Washington, DC: The National Academies Press. http://www.nap.edu/catalog/12528/phthalates-and-cumulative-risk-assessment-the-task-ahead. U.S. EPA (United States Environmental Protection Agency). 2015. Bis(2-ethylhexyl) phthalate (DEHP). Last updated September 10, 2015. https://www.epa.gov/sites/production/files/2016-09/documents/bis-2-ethylhexyl-phthalate.pdf (PDF) (4 pp, 79K).